According to the New York Times, in late 2002, Gina Haspel was dispatched to oversee a secret C.I.A. prison in Thailand code-named Cat's Eye. While she was there, C.I.A. contractors waterboarded al-Qaeda suspects including Abd al-Rahim al-Nashir, the man accused of orchestrating the bombing of the American destroyer U.S.S. Cole off the coast of Yemen in 2000. Based on her compelling testimony before the Senate Intelligence Committee, Haspel clearly believed that she was following the law when she authorized these "practices." She stated that her principals were well thought out and that she had the authority to make these decisions. Besides, the president, the Attorney General, and most members of Congress actually ordered them to be done in the name of national security. But torture is not wrong because it is illegal. Torture is illegal because it is wrong. Classified programs, oaths of allegiance, and upholding professional conduct will not make an immoral act/program justifiable- not even when it is deemed perfectly legal by lawmakers such as presidents and senators. Haspel may be a bureaucrat of remarkable intellect, unswerving loyalty, and self-evident leadership poise, but simply following orders has nothing to do with moral accountability. Apartheid was legal in South Africa. The Gestapo obediently followed orders in Germany. It was legal for Kim Jong-un to execute family members and feed their remains to dogs. Less than 100 years ago it was legal in certain parts of America to lynch a black person for trying to vote. Even Osama bin Laden reinterpreted Islamic theology in order to make killing other Muslims legally acceptable to Allah. 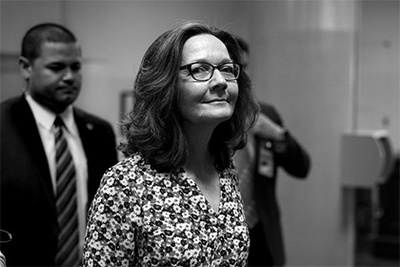 Since the Spanish Inquisition the same tactics used under Haspel's watch have been considered torture and immoral. Today, this belief has been codified into international law. Torture is wrong because it contaminates the intentions of anyone trying to pursue moral truth. It does not matter if Gina Haspel believes the C.I.A always follows the law. Does the CIA follow the Truth? We know that she followed orders without questioning them. But does she believe that torture is immoral today? That is the main issue. What say you, Ms. Hespal? George Cassidy Payne is a freelance writer, domestic violence counselor, and adjunct professor of philosophy. His blogs, essays, letters, poems, and photographs have been published a variety of domestic and foreign outlets including USA Today, The Atlantic, Rolling Stone, National Public Radio, the South China Morning News, the Buffalo News, Buffalo ArtVoice, The Albany Times Union, the Daily Caller, CityWatch LA, The Havana Times, Veterans for Peace, the Fellowship of Reconciliation, Pace e Bene, Syracuse Post Standard, Rochester Democrat and Chronicle, Rochester City Newspaper, the Minority Reporter, Rochester indymedia, The Daily Messenger Post, CounterPunch, Our Voice Magazine, The Franciscan Action Network, Ovi Magazine, and more.